Back in December Meizu first made the M1 Note official as its competitor of sorts to the highly successful Xiaomi Redmi Note (and other affordable phablets, of course). Then in January a new version with a different chipset got announced, but both of these have so far only been available in China. That's about to change soon, however. Meizu's official online store for international markets now has the banner image you can see below displayed when you visit it. 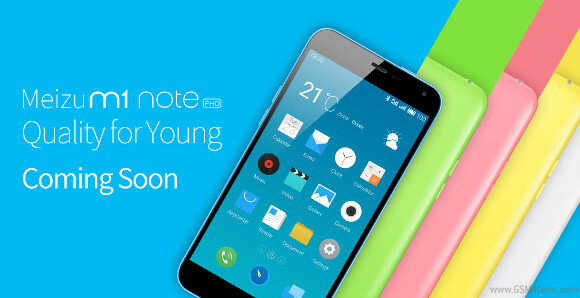 So it's clear - the M1 Note will shortly be offered to international buyers as well. What's still a mystery though is which version will be sold outside of China, the one with the MediaTek MT6752 SoC or the one with the Qualcomm Snapdragon 615 at the helm. The former seems to have the edge when it comes to performance, because its CPU has eight Cortex-A53 cores clocked at 1.7 GHz, whereas the Snapdragon 615 comes with a processor that has four Cortex-A53 cores clocked at 1.5 GHz and the other four going up only to 1 GHz. Whatever happens in this regard, the rest of the specs are obviously going to stay the same. So you should expect the Meizu M1 Note to pack a 5.5-inch 1080p touchscreen, a 13 MP rear camera with dual-LED flash, a 5 MP selfie snapper, 2GB of RAM, 16 or 32GB of non-expandable storage, and a 3,140 mAh battery. The handset will run Meizu's Flyme OS 4.0, based on Android 4.4.4 KitKat. International pricing is unknown at the moment. In China the M1 Note starts at CNY 999 (that's $160), but we're expecting there to be a slight premium for other markets. Just how much that will be remains to be seen however.